How to add setup Firebase configuration inside Android Studio Project and Add Update real time firebase database using EditText. In this tutorial we would going to insert multiple EditText data into Firebase runtime online database. 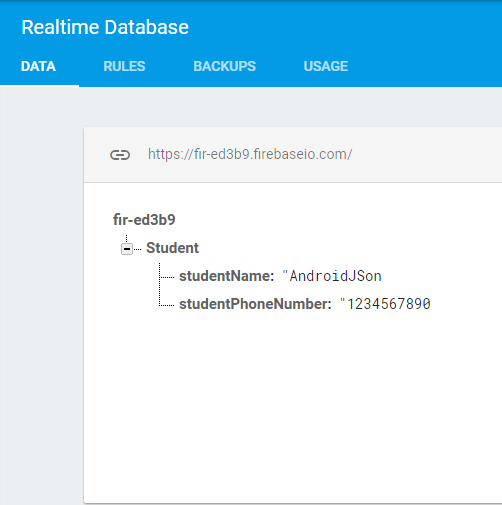 First we would configure the runtime database on online Firebase server then connect that database to our android app. 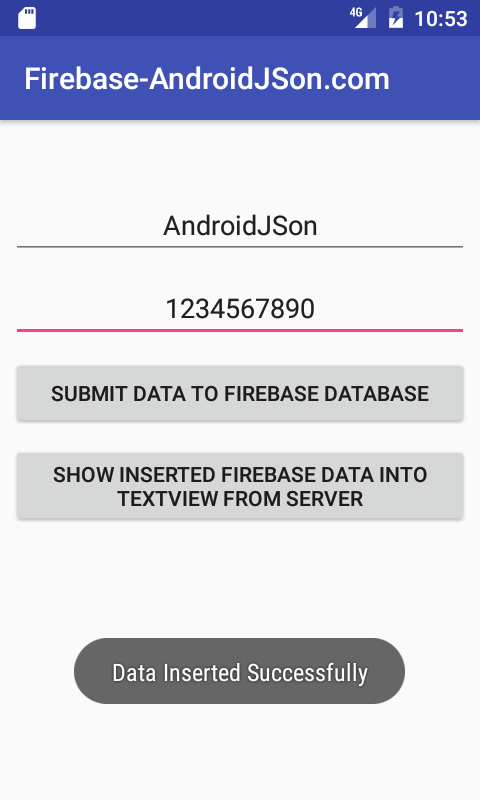 So here is the complete step by step tutorial for Android Firebase Tutorial-Insert Read Firebase data example tutorial. Watch the live application demo to know how this app works. Create a fresh android application in Studio. Create and configure and connect Firebase database to your Application. Note :- In source code section i already define each line work using comment so just read the code carefully and you will know exactly how each line works and what work perform each line code. 2. Create a fresh android application in Studio. Read my this tutorial to connect firebase directly to your android app by importing their libraries and dependencies. // // Declaring TextView object. // Adding MainActivity context into Firebase context. // Passing firebase Server URL into firebase object. // Adding Click listener to Submit button. // Declaring student class object. // Calling function to Get data from EditText and store into string variables. // Adding student name into student class object. // Adding student number into student class object. // Passing student phone number and name into firebase object to add into database. // Showing toast message after data inserted. // Adding click listener to Show data button. // Adding addValueEventListener method on firebase object. // Adding name and phone number of student into string that is coming from server. // Apply complete string variable into TextView. 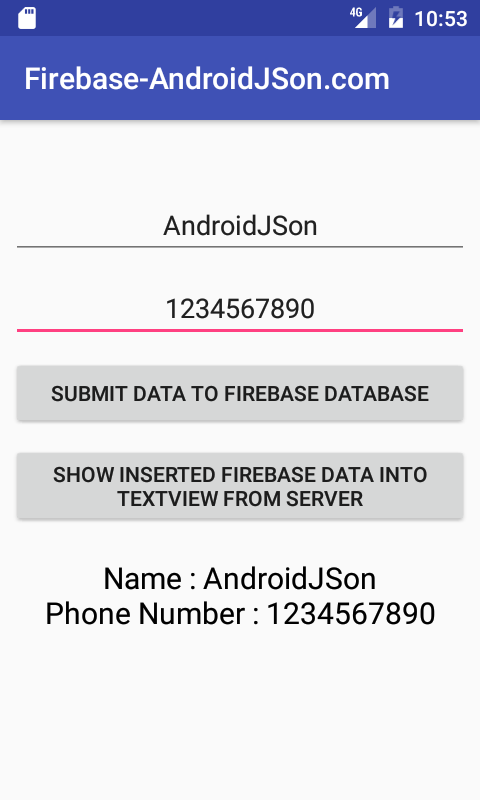 android:text="Submit Data To Firebase Database"
android:text="Show inserted Firebase data into TextView From Server"
* Created by AndroidJson.com on 5/5/2017. Avikal there is no need to use any URL, Just put your google services.json file which you have generated inside app folder like i have shown in the example. You can read my this tutorial https://androidjson.com/integrate-firebase-project-android-studio/ this would help you to generate your own google services.json file from firebase.